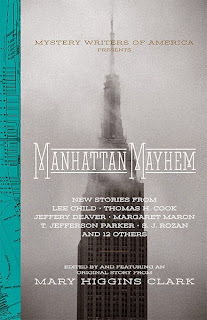 This is a collection of short stories to celebrate the 70th Anniversary of the Mystery Writers of America. There are some stunning photographs of New York in between each short story. Although Jack Reacher pays a visit to the Big Apple courtesy of Lee Child, my favourite stories were Three Little Words by Nancy Pickard and Me and Mikey by T. Jefferson Parker. In Three Little Words, Priscilla is told she only has a few weeks to live. One night while out jogging she is stabbed to death. The author lays out the potential murderers and I found myself choosing one then the other and changing my mind again. Me and Mikey reads like an episode of The Sopranos. The author paints a vivid picture of Little Italy and embraces the Italian emphasis on family. I'm not really a fan of short stories but the photos alone made this one worth reading.